The 21st Century values time down to the smallest increment.If browsers do not spit back the desired answers in less than a quarter-second, exasperation sets in. We no longer even use the original term for a browser: search engine. Are three syllables so much more onerous than two? Perhaps nowhere is wasted time more acutely sensed than in our cars. One study conducted by Texas A&M University's Transportation Institute sampled data across the US, which shows drivers stuck in traffic 38 hours per year. A similar study of Britain's high-density centres carried out by the Centre for Economics and Business Research shows motorists idling 50 hours annually. 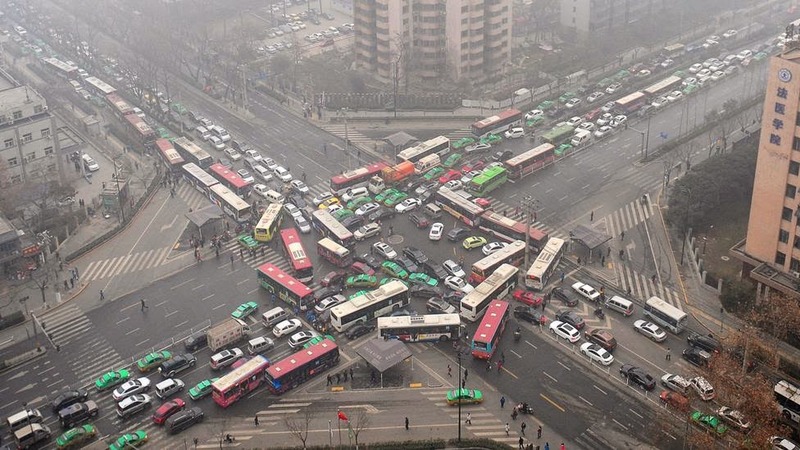 Traffic in Paris, Rome, Los Angeles, Tokyo and Shanghai is legendary and only getting worse. We may love to romanticize life behind the wheel of Ferraris, Lamborghinis, Porsches and 707-horsepower Hellcats on bucolic, sinewy country roads and the odd dragstrip. But the reality is nose-to-tail arterial sclerosis. New traffic signal mechanisms, however, which leverage cameras, computer software and timing equipment, have been netting impressive traffic reductions in urban centres around the world. These solutions keep traffic flowing based on real-time data streaming into the systems. Related: Inside the hidden traffic ‘brain’ of Los Angeles. One of the most successful – and newest – of these is found in New Jersey’s Meadowlands, just across the Hudson River from Manhattan, in a traditionally traffic-plagued corridor near MetLife Stadium, where two American football teams, the Giants and Jets, play. David Liebgold, transportation chief for the New Jersey Meadowlands Commission, is responsible for the state-of-the-art, camera-driven dynamic signal system recently installed near the arena. Since the beginning of its rollout in December 2012, the system has led to a net reduction in congestion of 25%, a figure that should improve as the system reaches full implementation later this year. Liebgold cites an original estimate of 400,000 vehicles per day along the corridor, a figure that proved very conservative, partly because individual cars often traverse the area at least twice per day. Since deploying an adaptive signal system, the commission cites an average travel-time savings of five seconds per car, per day. Such incremental improvements lead to significant savings: about 1,100 driver-hours per day, or nearly 406,000 hours per year; roughly 1m gallons of fuel; and nearly 5,000 tonnes of greenhouse gases. This $13m, 40-square-mile project links 120 traffic lights in the vicinity, with an additional 24 planned. 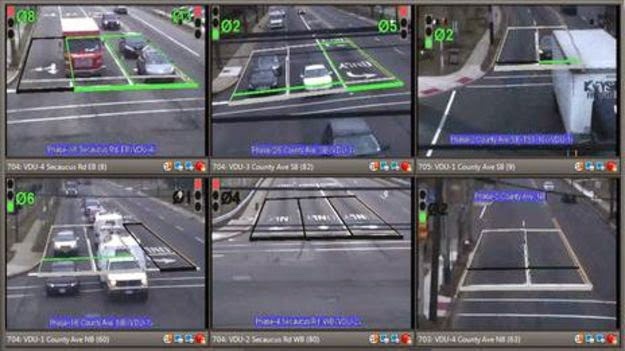 Cameras feed computers that then calculate the most efficient traffic-light timing for the given moment, where seconds can make big differences. Lights in such a system are wired together and operate as one large brain. And unlike some systems, the Meadowlands solution varies signal timing by a wide margin based on actual traffic flow, not pre-determined hypothetical – and fixed – rush-hour and off-peak calculations. That adaptability yields big gains. If an accident occurs within the zone on one of the routes, lights on nearby routes will adjust to relieve the resulting congestion, within safe parameters. At the system's control centre, 16 screens, each 60in wide, display video from 400 cameras. The system is also overseen by staff, which can make manual adjustments if need be. Time and distance between lights are the critical traffic-flow “levers” that can be pulled in most metropolitan areas. If timing is off, even by one second, flow can be greatly impacted. For years, traffic engineers have timed pre-programmed signal systems based on the understanding that optimal city traffic flow hovers around 27mph (43km/h). As more cities adopt traffic signals that absorb real-time input from cameras and sensors, motorists should perceive improvements – however incremental – in traffic flow. Some data, however, counters this potentially bright picture. A recent overall study from the US Department of Transportation indicates, if nothing else, that adaptive traffic controls such as the one in the Meadowlands are anything but silver-bullet solutions. The study cited a 40% improvement in traffic flow on the high end, to no notable improvement at all in some metropolitan areas. The cross-report average is rosier; 60% of the locales that deployed adaptive systems cited an improvement in travel time and reduction of delays. Can such traffic solutions be used to reduce wear and tear on the environment, road infrastructure and your nervous system? It would seem their time has already come.